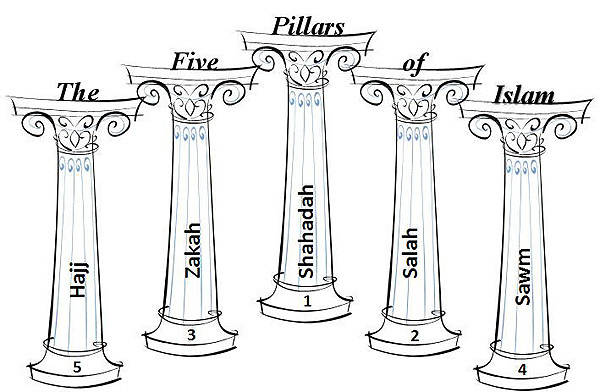 The Five Pillars of Islam (arkān-al-Islām أركان الإسلام; also arkān ad-dīn أركان الدين "pillars of the religion") refer to five basic acts of the Islamic religion, considered mandatory by the believers and serve as the foundation of Muslim life. They have not been mentioned in the Quran. They form the basis of Muslim life, prayer, self purification, pilgrimage and concern for the needy. Shahada is the renouncement of faith and trust in Islam. It refers to the professing that there exists only one God, Allah, and that God’s messenger is Muhammad. This is known as Monotheism. A set statement normally recited in Arabic is Kalima: 'La 'ilea-ha 'IL-all-laa-hu mu-ham-ma-door Ra-soo-lul-laah "I bear witness that there is no one worthy of worship other than God Himself and that His Messenger and Servant is Muhammad." It is compulsory to recite this statement in the daily prayer (salāh) and on other occasions. It is also a key aspect of a person's conversion to Islam. The giver must remember God and express his intention to give the zakāt. The zakāt has to be paid on the day that it is due. Post offering, the person who paid should not exaggerate about spending his money more than usual means. Payment must be done in kind. This means that if someone is wealthy, then he or she has to pay 2.5% of their income. If a person does not enough money, then they have to compensate for it in various ways, for example good deeds and good behavior toward other people. The zakāt has to be distributed in the same community from which it was taken. Ritual fasting is an mandatory act practiced during the month of Ramadan. Muslims must refrain themselves from drinking and eating right from dawn till dusk throughout this month. In addition, they are to be extremely mindful about their other sins. Fasting is compulsory for every Muslim who has reached puberty (unless he or she suffers from any medical condition which thus prevents him or her from doing so). This fast is supposed to allow Muslims to seek closeness and to search for forgiveness from Allah, to express their dependence and gratitude towards Him, to atone for their sins of the past and to remind themselves of the needy. During the Ramadan period, Muslims are expected to put increased effort into following the various teachings of Islam by abstaining from violence, envy, greed, anger, profane language, gossip, lust and to try and get along with fellow Muslims better. In addition to this, all irreligious and obscene sights and sounds are to be ignored. Fasting during Ramadan is mandatory. However, it is forbidden for several groups for whom it would be very dangerous and extremely problematic. These include the pre-pubescent children, those with a medical condition, for example, diabetes, pregnant or breastfeeding women and elderly people. Even observing fasts is avoided for menstruating women. Among other individuals for whom it is considered acceptable not to fast lie those who are ill or traveling. Missing any fast usually must be compensated for soon afterward, although the exact requirements may vary according to circumstance. The Hajj is a pilgrimage occurring during the Islamic month of Dhu al-Hijjah towards the holy city of Mecca. Every Muslim who is able-bodied is compelled to take part in the pilgrimage to Mecca at least once during their lifetime. When the pilgrim is around 10 km from Mecca, he or she must be dressed in Ihram clothing, which comprises two white sheets. Both women and men are obliged to make the pilgrimage to Mecca. Once a Muslim makes their trip to Mecca, he or she is referred to as a hajj or hajja (one who underwent the pilgrimage to Mecca. The significant rituals of the Hajj include walking seven times around the Tawaf or Kaaba, touching the Black Stone termed Istilam, then traveling seven times the distance between Mount Safa and Mount Marwah which is termed as Sa'yee, and finally symbolically stoning the Devil in Mina which is termed Ramee. The pilgrim or the haji is respected in the Muslim community. Islamic teachers declare that the Hajj should be considered as an expression of devotion to Allah and not a means to gain a social position of respect. The believer should be aware of themselves and analyze their intentions in undertaking the pilgrimage. This should lead to the striving for self-improvement. A pilgrimage which is made at any other time than the Hajj season is called an Umrah. While it is not mandatory, it is strongly recommended. Also, they make a pilgrimage to Jerusalem in their alms and give feast.